A trail camera is a camera which you leave somewhere, usually outside, and it automatically takes pictures or video when it detects motion. 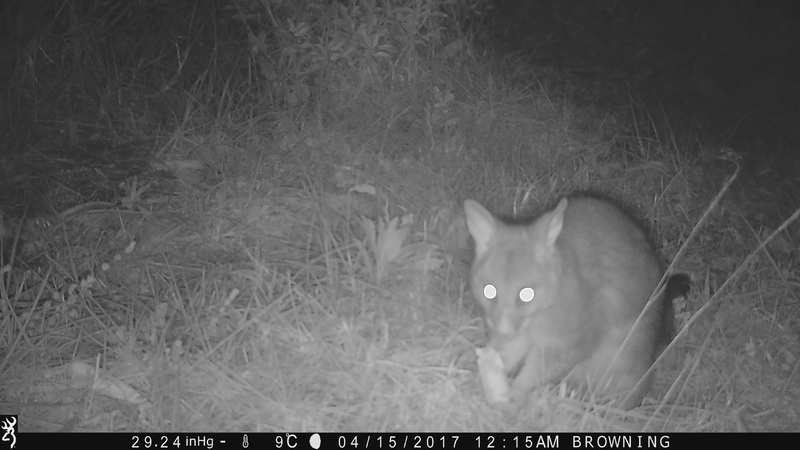 Since most of Australia's mammals are nocturnal, we rarely see them. A trail camera is the ideal way to learn about them. Whether or not you're not interested in learning to trap for survival purposes (or for any other reason). Photo: Brush-Tailed Possum. High Resolution 4320 x 2430. 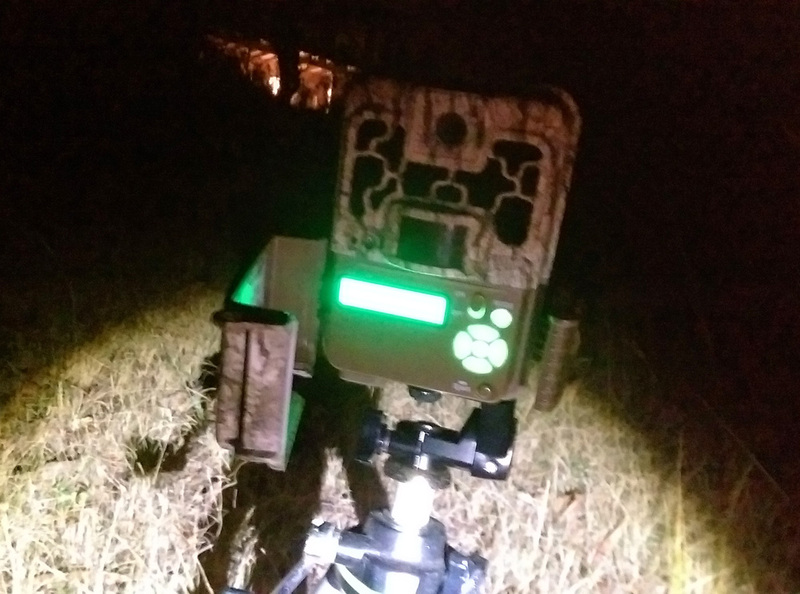 Most trail cameras have the capability to take pictures at night, with a built-in flash. Many models have an invisible infrared flash, so that the flash happens and the photo is taken without anything being seen other than the camera just sitting there, apparently doing nothing. Usually trail cameras painted with a "camo" type of colouring and are waterproof enough to be left out in the rain. They can be tied or strapped onto a tree or other structure, or mounted on a tripod like you'd use with an ordinary camera. Usually it's possible to strap them (for e.g. to a big tree trunk) with a steel cable similar to a bicycle lock as a theft deterrent. In the daytime, colour pictures can be taken. High Resolution 4320 x 2430. If you live in an ordinary residential area, it can be somewhat difficult to learn and to practice your trapping skills. You can learn to make and set up traps, but you can't leave them set nor catch anything in them. Apart from a few very limited situations like an indoor mouse or rat trap. It's illegal to set traps in most domestic environments, and for good reason — you'd be likely to kill someone's beloved pet cat or dog. It's also illegal to kill many native animals, especially mammals. Something is sneaking into view... High Resolution 4320 x 2430. The cat looks different in the dark, seen in infrared light. High Resolution 4320 x 2432. This limitation leaves the other half of trapping (leaving your traps set up in the field, and catching animals) completely unexplored territory for most people in modern society. So how can you learn to trap without having to kill anything? 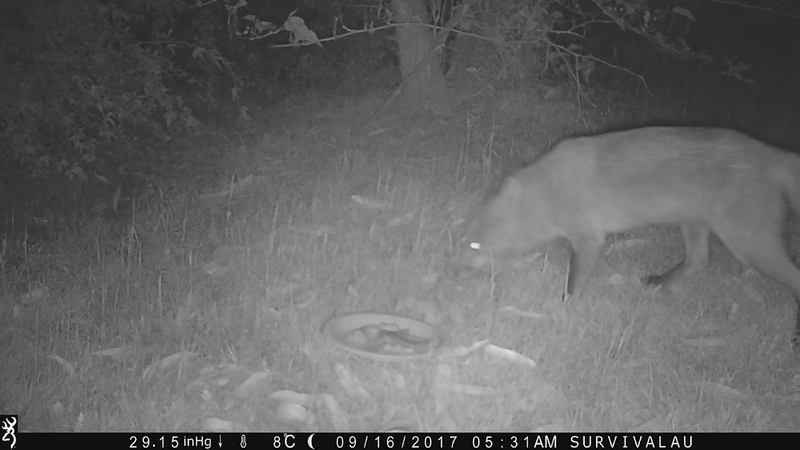 The answer is to learn to trap with a camera trap, a.k.a. trail camera. My Browning Spec Ops BTC-8FHD trail camera. The display is illuminated bright green. High Resolution 2046 x 1520. Below you can see the trail camera set up on an old tripod.The tripod is useful because it can sit anywhere, the legs can be adjusted for uneven ground, and the camera can be tilted to point at any angle. The bait in this photo is pet grade raw lamb on a white disposable dinner plate. 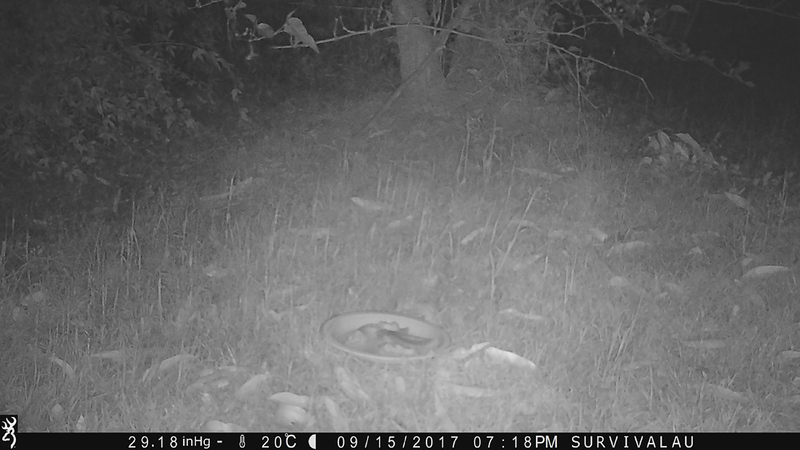 I used the plate so I could see clearly in the photos where the bait is, as it can be hard to see on the ground surrounded by grass. The front door of the camera is still open, it would be closed when it's finished being set up for the night. 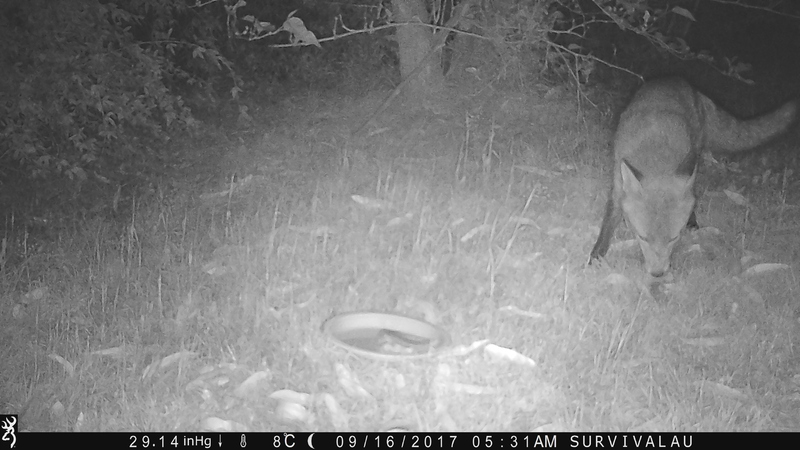 Trail camera set up with bait. 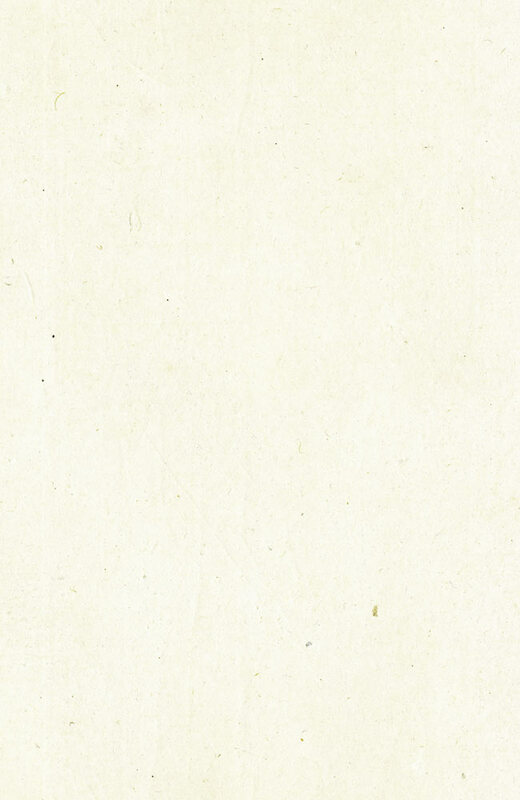 High Resolution 2391 x 1520. Of course you could hide the camera much better. You could also take measures (like in real trapping) to hide your scent from getting on the camera and (especially) on and near the bait. However such measures aren't always necessary. 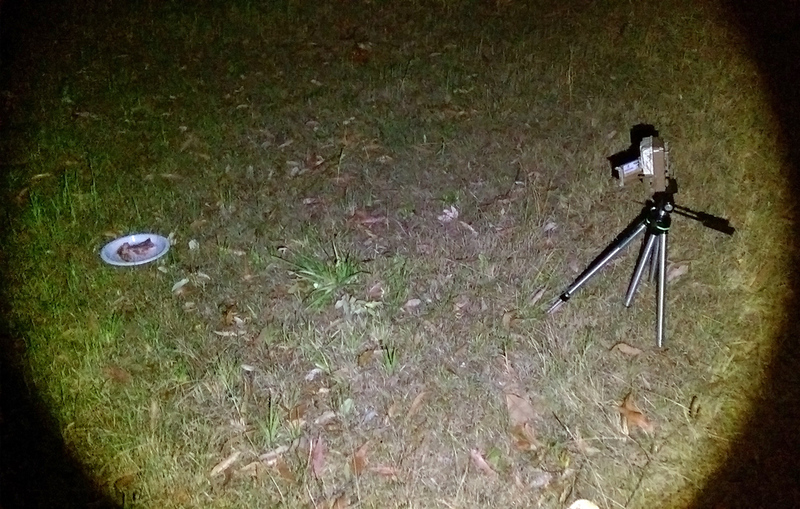 It can be as easy as this simple setup to take pictures of animals. The exact setup as pictured here, in a suburban backyard with a very small patch of bush at the back, captured the fox photos seen further down the page. It doesn't get much easier than this. You can always increase the difficulty later (by going after rarer animals for example). Getting results early on with minimal effort makes it easy to stay interested and motivated. 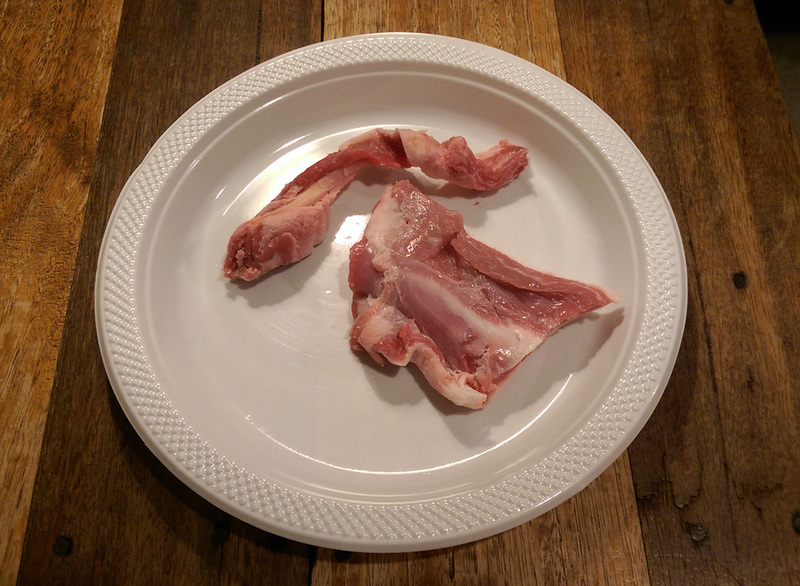 This fresh pet-grade meat was $2.99 a kilo. 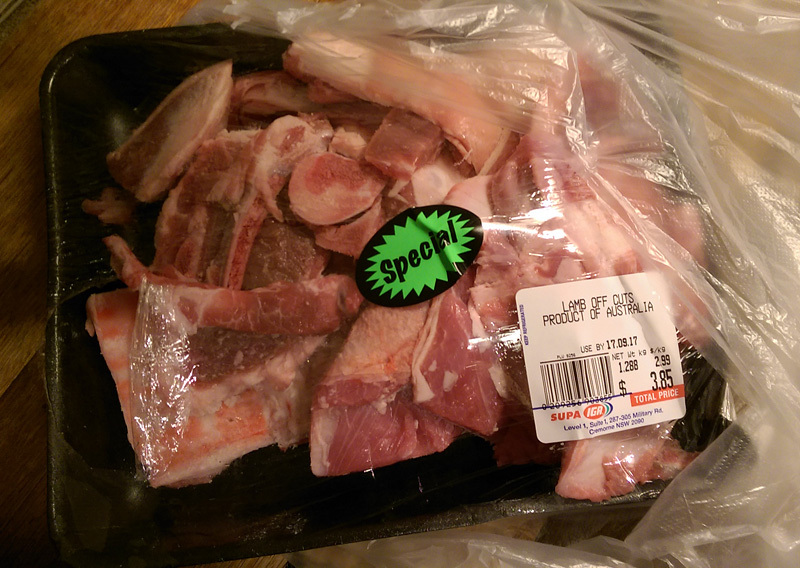 This is about 10-20 cents worth of meat. The rest can be frozen or fed to pets. 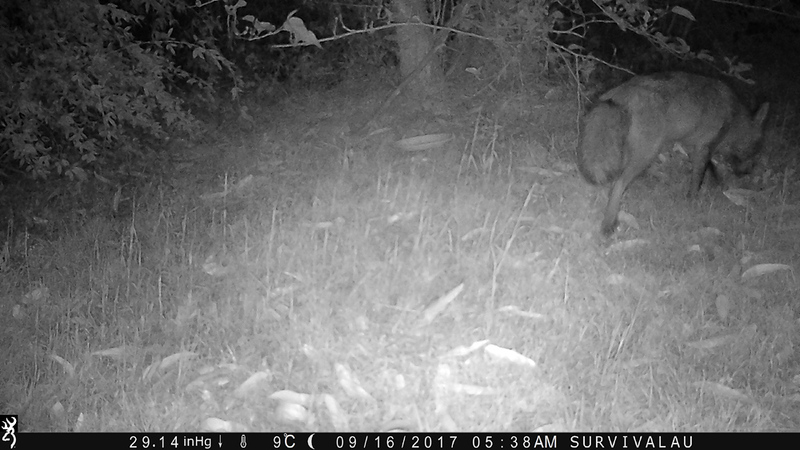 Of course using a trail camera is not a completely realistic practice, as you don't get to find out if your actual traps would have been triggered, and if they were triggered, would the animal have been actually caught. But there are other advantages — things you don't get the benefit of without the trail camera. Of course if you lived in an area where you can really trap things, and even if you're setting an indoor mouse or rat trap, you can still use the trail camera to learn a lot of additional things which you wouldn't know otherwise. Like exactly what time the animals come. Like how they move and behave when approaching the trap. Like if the trap fails to catch the animal, you can see how it all happens on your photos or video. 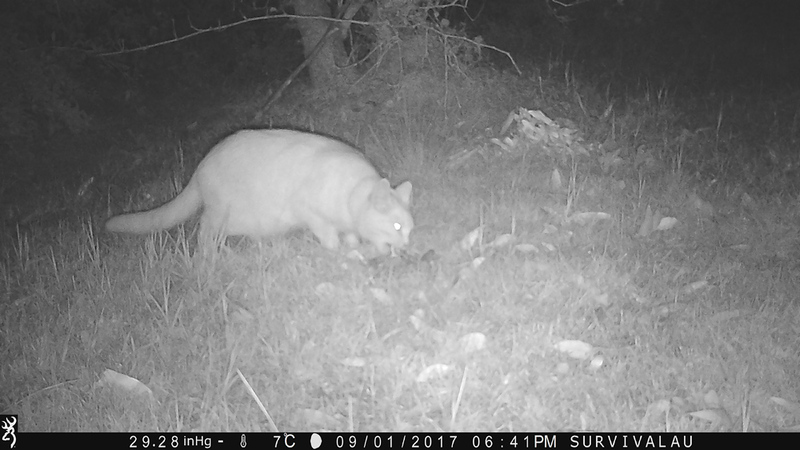 At first I was suprised how interested the possums are in meat. High Resolution 4320 x 2432. 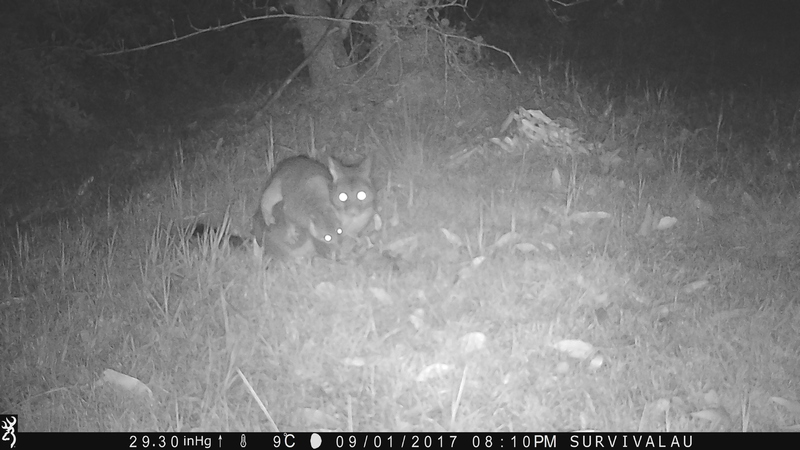 On my trail camera the temperature recorded on the photo isn't precisely accurate. Still it's much better than having no temperature information. The phase of the moon is shown correctly. I haven't checked how accurate the atmospheric pressure reading is. 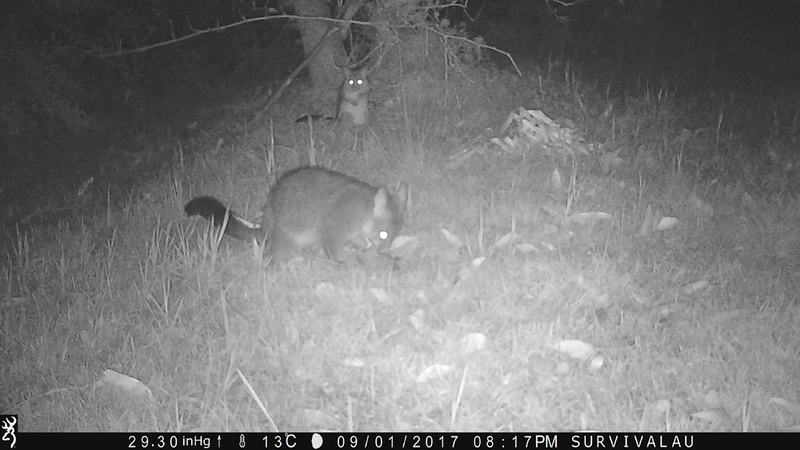 There were 221 pictures of this mum and baby possum taken between 8:04 and 8:50 pm. High Resolution 4320 x 2432. When I was a young child, I remember watching TV documentaries where they had used hidden cameras to record animals doing things. It seemed so amazing, that there could be technology capable of doing that. It was so far out of my own reach (or that of most people with normal incomes and wealth) it might as well have been showing hidden cameras used in the NASA space program. And now this level of technology is easily affordable by nearly everyone in modern society. 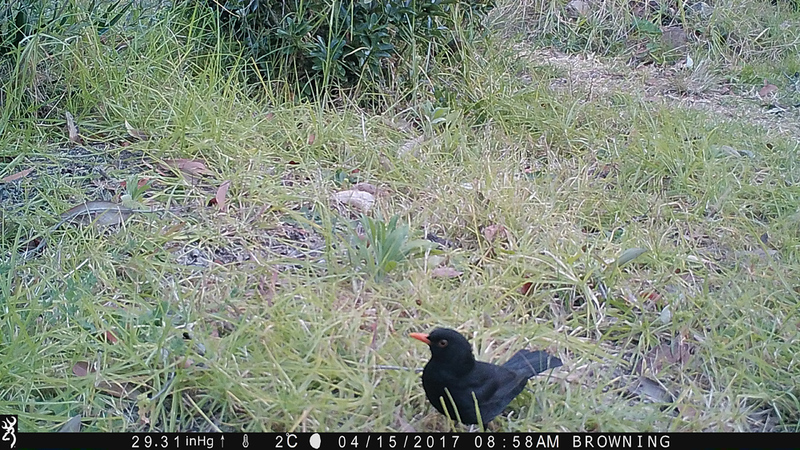 The common blackbird. High Resolution 4320 x 2432. 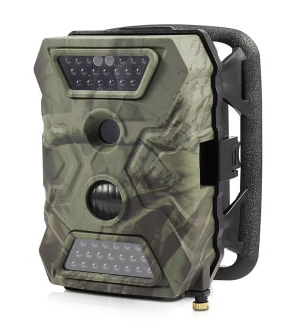 When deciding which brand and model of trail camera to purchase, the main thing I looked for, other than just the overall quality, was did it have a completely invisible flash? Some models (especially the cheapest ones) which have "infrared" flash are still visible to the eye when they flash. Presumably most of the light is being emitted in the infrared, but there's some just ordinary red light which is also emitted, and you can see that when it flashes. The better ones have a completely invisible flash, meaning that all the light emitted by the flash is in the infrared part of the spectrum. 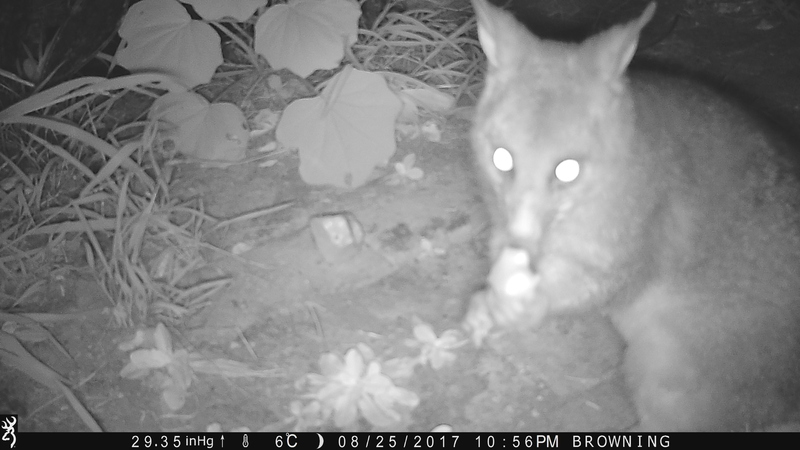 Although when I've caught images of possums, often the possum was staring directly at the trail camera — and there seemed to be too many of these photos to be just coincidence. And I wondered if the possum's eyes could maybe see some of the light from the flash. It didn't seem scared by it though (because there were plenty more pictures of the possum after it was looking right at the camera). This possum is too close for the camera to focus properly. Note how the ground behind is in focus. High Resolution 4320 x 2432. When I got my trail camera, and started to look at the manual and the menus to set it up, I was a bit disappointed that it could only be set to take still photos or video, but not to take both in the same session. However, after I thought about it, I guess this is logical. Since the camera can't do two things at once. And it wouldn't know which of the two it was supposed to do after detecting motion. 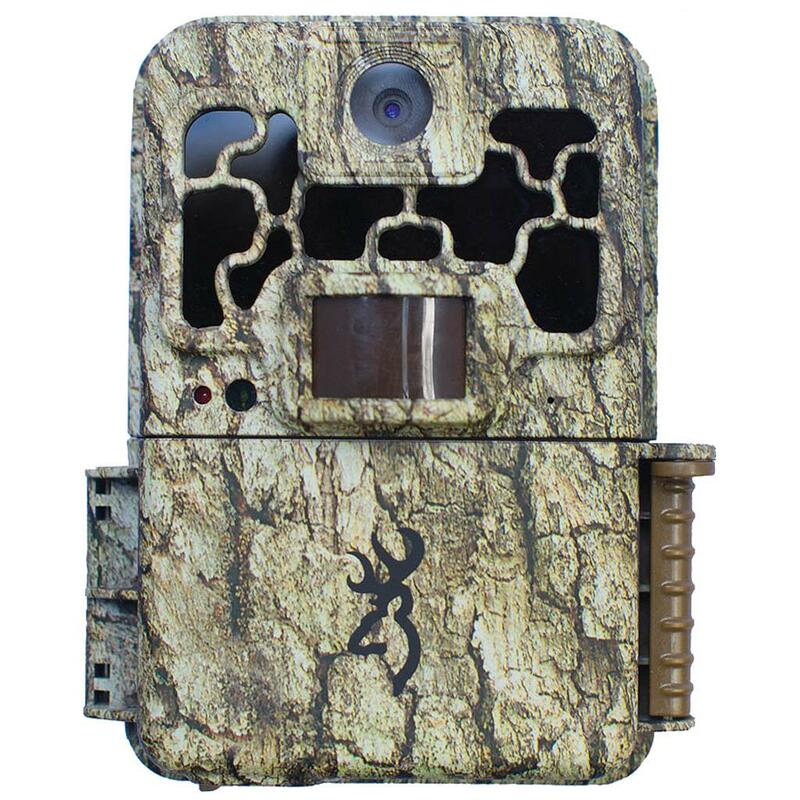 If you really wanted both still pictures and video of the same event, you could use two trail cameras. Or use frame captures from the video, though the quality of these would be less than actual still pictures. I have the trail camera set to take still pictures every 5 seconds, which is the shortest interval in the menu. There is some risk of your trail camera being stolen, so you need to be careful to set it up to minimise the chance of this. While annoying, this is actually part of the practice for real trapping — since you wouldn't want your potential dinner being taken by another animal or person before you retrieve it. Waiting for an animal... What will come? High Resolution 4320 x 2430. Here it comes! First glimpse... looks like a fox. High Resolution 4320 x 2430. Yep, it's a red fox (the only kind we have here). High Resolution 4320 x 2432. This photo is a bit clearer. High Resolution 4320 x 2432. 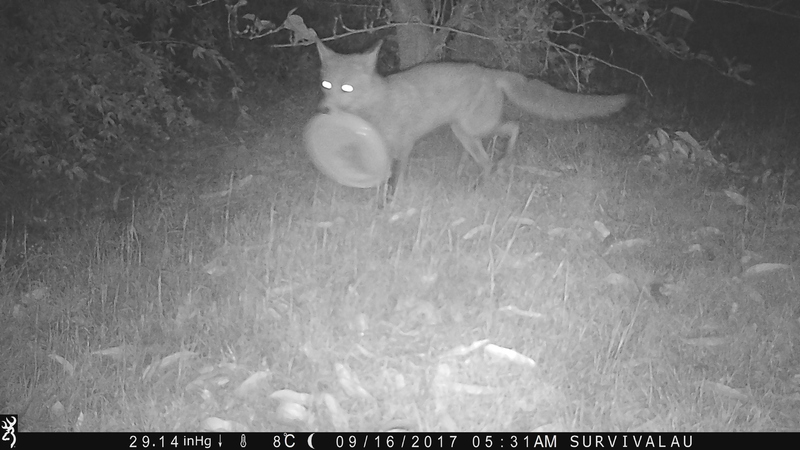 The fox picks up the plastic plate. High Resolution 4320 x 2432. Away it goes... High Resolution 4320 x 2430. 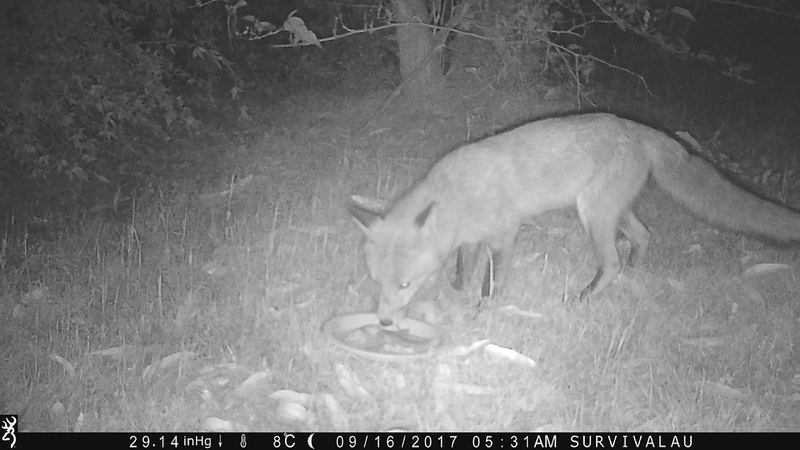 On this occasion there were 24 pictures of the red fox captured in total, all between 5:31 and 5:38 am. This is the camera I have, but a newer version. I think mine is the 2015 version. There are a few varieties of this camera. The current "Extreme" version has an X at the end of the model number, i.e. BTC-8FHDX. There's a platinum version with a P at the end of the model number, I think the platinum one has a colour LCD screen to view images on (like a digital camera). My one does not have this, it only has a small two-line black-and-white LCD screen that shows writing only (for mode settings, etc.). My one has a nice bright green backlight. Since there are several versions, it's best to check out the exact features a particular one has with a retailer. Each year the cameras generally improve with more megapixels and better other features. The Spec Ops has "no-glow" infrared LED flash, which is really invisible, at least I can't see anything at all when it flashes in the dark. 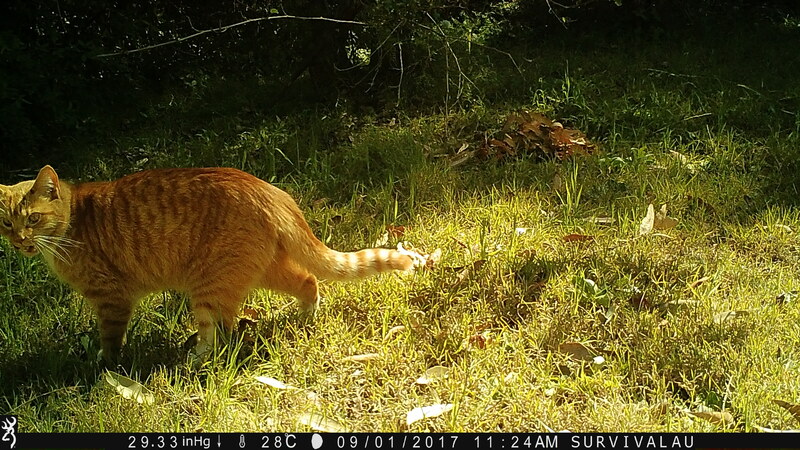 A trail camera (a.k.a. 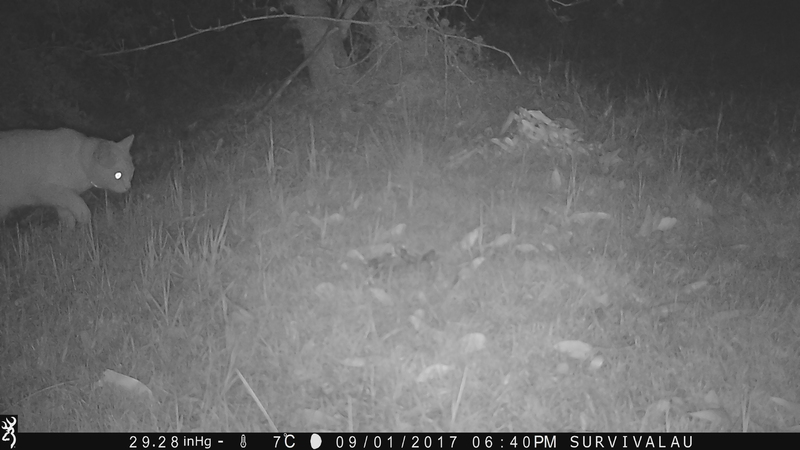 camera trap) isn't a survival tool in itself, but it allows you to practice trapping animals without having to actually trap them (since this is illegal in most places). The official description says "Designed to withstand the toughest outdoor climates and situations, this powerful surveillance system is created in a portable, water resistant design. Enjoy around the clock operation in any conditions thanks to a durable, water resistant casingthat can operate in weather conditions and temperatures down to -20!C. Capture clear photos with the 12 MP camera or record HD 1080p videos at 15 frames per second, with powerful night vision reaching up to 15m. Set and forget with long lasting battery operation for extended monitoring over several months plus. Keep a lookout in remote areas with portability by mounting to trees, posts or flat surfaces to monitor farm or wild animals." My Browning trail camera does not have an LCD screen, which would be a nice feature. Technology has advanced since I got mine. From the product information, "Excellent Image and Performance: Ultra-high performance 12 million pixel resolution, 1080P HD video recording can be in the day or night can clearly capture the wild animals of each action. At the same time can be -20 degrees Celsius -60 degrees Celsius extreme temperature, and the camera has a super waterproof function. Consumption and Response: Wildlife camera running very low power, can provide long running time, in standby mode, the use of four AA batteries up to 3 months, the use of 8 AA up to 6 months battery, more energy Environmental protection. Wildlife camera has a very fast capture effect, the reaction time as low as 1 second, you can capture every subtle action, while high sensitivity infrared sensor (PIR, passive infrared sensor) on the camera to open, activate the image or video mode. Multi-functional Experience: 500 million pixel sensor, the assessment area can be on the environment, the temperature changes have a sensitive response. 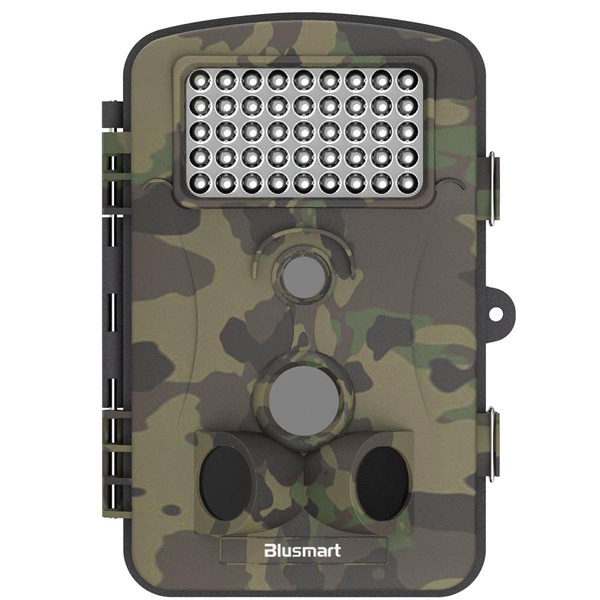 The hunting camera also uses the serial number function, the location can be edited in the photo, easy to find, while the photos will have time, date, temperature display, lock and password protection, low battery reminder. Shooting Range and Installation Use: The trail camera shooting range is very wide, shooting width of 120 degrees, night vision distance of up to 65 inches, do not worry about day or night problems. In order to be able to use more customers more, we have the camera operation and installation of the continuous simplification, but also with detailed instructions, do not worry about the use of inconvenience. " It's very good that we don't have to worry about the use of inconvenience.